An ancient Tamil civilization under the Indian Ocean? Kumari Kandam, also known to be ‘lost subcontinent’ is believed to have existed in the south of Modern India, now below the Indian Ocean. The Tamils that lived there are accredited for the creation of other civilizations after the ‘sub-continent’ disappeared. 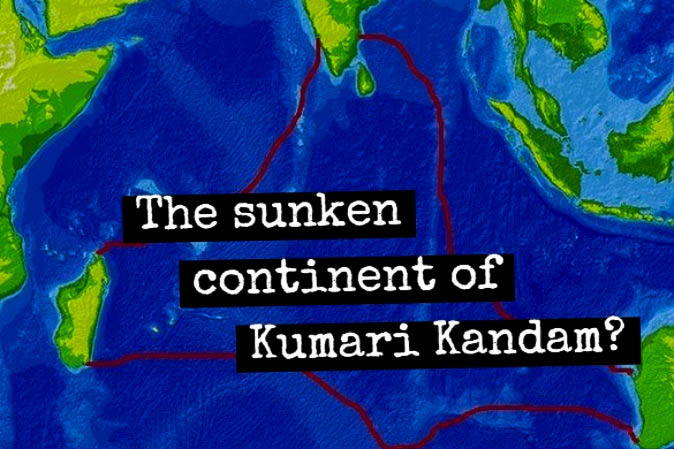 Similar to the story of Atlantis, the story behind Lemuria and Kumari Kandam is interesting. Kumari Kandam is a lost continent, a home to the Ancient Tamil people and there are several names by which the continent is called - Kumari Kandam, Kumarikkantam, and Kumari Nadu. Soon after the scholars published their knowledge about the lost continent below the Indian Ocean, people sought the ancient Tamil and Sanskrit texts for deeper study. Lemuria was the name given before the landmass disappeared in a catastrophe. However, after the ‘continental drift theory’, this theory of a lost continent below the ocean is referred as baseless by modern-day scholars. Something that acts as an evidence for Kumari Kandam’s existence is - Adam’s bridge, also called Rama’s Bridge which was a strip of land located in the Palk Strait extending 18miles from mainland India to Sri Lanka. The composition was a chain of limestone shoals made of sand and small pebbles. It is believed to be formed naturally but images shot by a NASA satellite depicts the composition to somewhat of a long broken bridge below the ocean. This broken bridge is backed by another ancient legend. Ramayana depicts Sita, the wife of Rama, who was being held as a captive on the Island of Lanka. Rama orders a huge bridge to be constructed to transport his army of Vanara (ape men) to reach Lanka. A myth like this give a slight of ray of hope to ancient Tamil legends of Kumari Kandam being true but doesn’t guarantee complete authenticity.